My lovely sister informed me of a pond nearby with blooming water lilies, so we headed out to take some pictures. Then we took Grandma out to show her the lilies the next day. It was a pretty impromptu trip, but the girls didn't really mind exploring in their dresses. The water lilies are beautiful. We also learned they have very tough stems, and the flowers smell like almond extract. The girls got especially excited anytime they could spot a frog! This little trip got me thinking about something I could put together with the girls to learn a little about the pond. 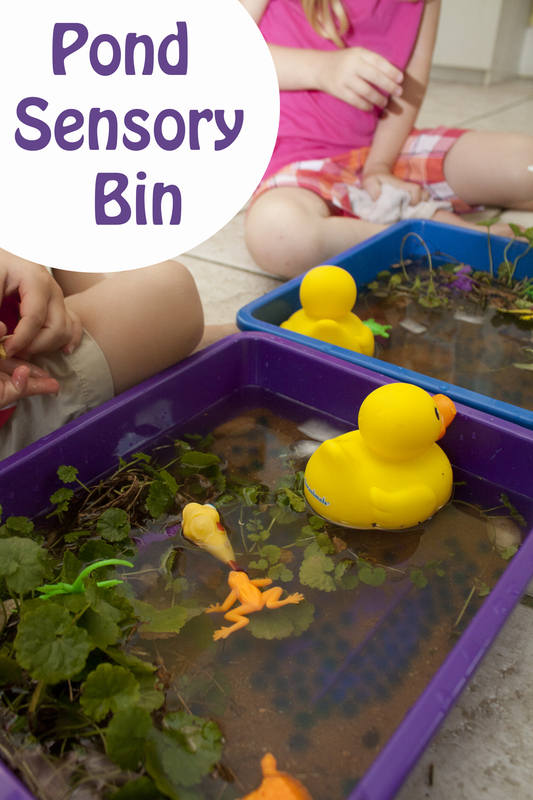 What I came up with was a little sensory bin that we could put together out of stuff we had at home (this also made me think we keep some odd things around this house). We started with a little blue plastic bin. We added some sand to the bottom. I did not add dirt; I did not want that big of a mess! We did have some nice smooth rocks to stick in too. Then we added a little water. We added some weeds I found in the back yard that resembled water lilies. I suppose I could have found some fake water lilies, but that would have required a trip to the store. Besides with these they could see how the roots would still be under ground. We added a little more water after we got our plants situated. Just for fun we through in some blue water beads for bubbles, frog or fish eggs, or whatever. And our little pond is complete! We added some ice to ours as well to show the girls how the ice would float, so the fishes could still live in the pond through the winter. I also found this little worksheet to show the girls the life cycle of a frog, Frog Life Cycle, all they had to do was color it.